Sometimes they shake underneath the table, too. 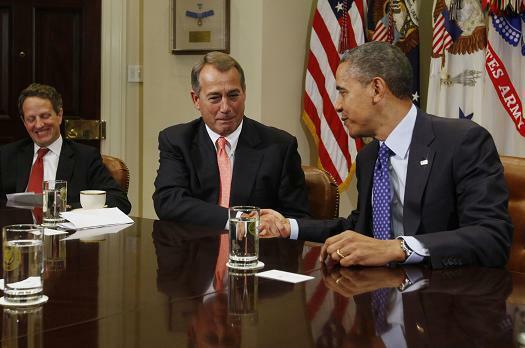 It just seems that Boehner and Obama have made an under-the-table agreement to pass amnesty by Obama’s diktat. Sure, Boehner complains somewhat bitterly and gives the Constitution lip service, but he is not taking effective steps to stop Obama. Watch what he does, not what he says. Boehner’s lawsuits are just a waste of time and money, designed to kick the ball down the road until people forget and it is too late to do anything about Obama’s latest usurpation. Both Parties have tried to pass a sovereignty-destroying amnesty in the last few years when the parties at different times controlled both Houses and the Presidency. The members of both parties were afraid of the consequences of voting for such a treasonous act. So, it appears the leaders of the parties have just agreed to allow Obama to dictate an amnesty. Let’s not be naive about our corrupt political leadership. Every great nation has experienced corruption, intrigue and treason among its top leaders, because so much is at stake. Why should it be any different with America? The international financial backers of both Parties want Amnesty. Their financial string-pullers do not give a damn for the Constitution and the Rule of Law. The Rule of Law just stands in their way of growing their global financial empires. Do not expect Boehner to reverse Obama’s illegal amnesty or those additional phases of wider dictated amnesty yet to come. It is not just that illegal aliens will be cheap workers and compliant voters, but many of them would be expected to help in any future violent terroristic uprisings. This sets the precedent that there are no limits on what Obama can dictate, a treasonous conspiracy to overturn the American system of Government. It has been a long, long time since we have hanged traitors and for this reason there are so many of them of both Parties at the upper levels of Government today. Impeach Obama and get rid of Boehner.